The Spring 2018 issue of the Michael Clark Photography Newsletter is now available for download. If you’d like to sign up for the Newsletter just drop me an email and I’ll add you to the mailing list. 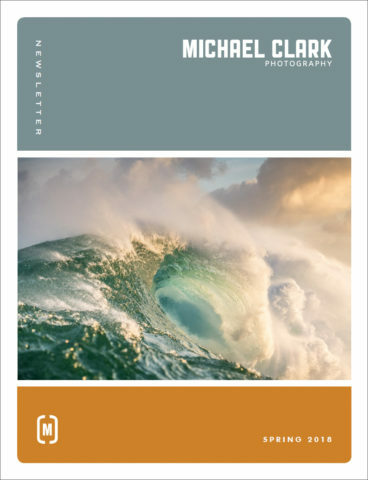 This issue includes an editorial asking for feedback on the Newsletter, a review of the new features in Adobe Lightroom Classic CC, an article detailing my recent big wave surfing shoot at Peahi– also known as JAWS, an editorial entitled Embracing Failure, and much more.